Also, this was the first time I made biscuits using a biscuit cutter! In the past, I’ve used a glass or a mason jar ring to make my cuts. My biscuits were fine, even great, but I didn’t get the beautiful distinct layers that I got with my biscuit cutter. If you’re making biscuits on the regular, I’d recommend picking up a set of biscuit cutters or a round cookie cutter. A flaky buttermilk biscuit recipe. My riff on Bon Appetit's Best. Preheat the oven to 425 F. In a large bowl, combine the flour, baking powder, salt, sugar, and baking soda. Mix together thoroughly. Add the cubes of butter to the bowl. The key to flaky biscuits is to keep the butter cold and preserve a few chunks throughout the dough. Use a pastry cutter, knife, or fork to cut and crumble the butter into the flour. You can also use your fingertips to work the butter in, using a gentle touch and rubbing the flour and butter together. Continue to work the flour and butter together, until any chunks of butter are pea-sized or smaller. You do want to have many pea-sized chunks left at this point– be careful not to overwork the dough. Create a well in the middle of the flour mixture and pour in the buttermilk. Use a fork or spoon to mix until all of the ingredients are just incorporated. Again, careful not to overwork. The dough will be craggy and uneven at this point. Turn the dough out onto a lightly floured counter or work surface. Pat into a large rectangle about 1 inch thick. Cut into 4 even pieces. Stack the pieces on top of each other, and roll or pat gently until about 3/4 to 1 inch thick again. Cut into 12 pieces with a knife, or use a biscuit or cookie cutter. If re-rolling scraps, try to stack the scraps together and flatten gently, instead of kneading or rolling together. 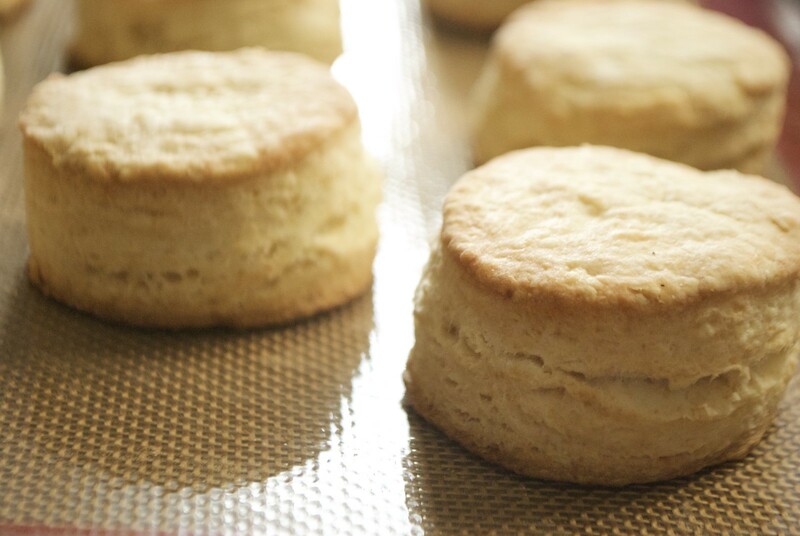 Place the biscuits on a parchment-lined baking sheet with at least 1 inch between each biscuit. Place in the freezer to chill for 10 minutes. Reduce the oven temperature to 400 F, and bake for 20-25 minutes until tops are golden-brown. I was able to use 14 tbsp butter in the dough (instead of the 16 tbsp listed) and still ended up with a light, flaky biscuit. I also skipped brushing the tops of the biscuits with more butter. You can make these biscuits up to one month ahead of time. Freeze on a baking sheet, then transfer to a ziploc bag or airtight container for storage. Bake directly from frozen, adding 5 minutes to the baking time.